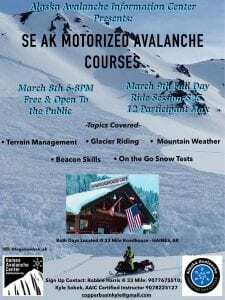 The AAIC team of instructors will present a Snowmobile Riders avalanche and backcountry travel workshop on Friday, March 8th from 6-8 pm at 33 Mile Roadhouse near Haines, Alaska. 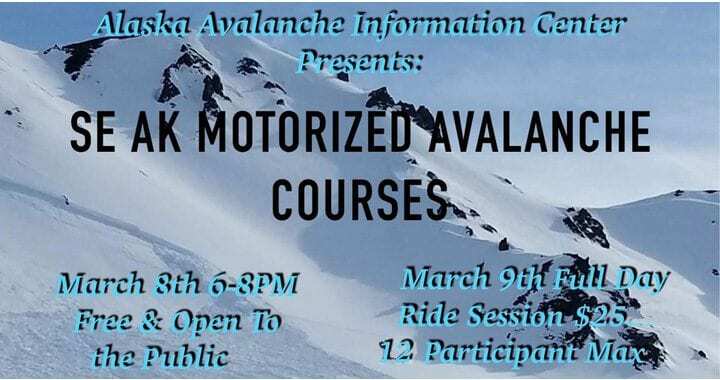 This portion of the course is free and open to all riders and backcountry travelers thanks to support from the Alaska Department of Public Safety. Saturday will feature a full day in-the-field workshop starting at 9 am at 33 Mile Roadhouse. This course is just $25 to cover basic instruction expenses thanks to support from the Haines Borough and the Haines Avalanche Information Center.